MENLO PARK, CA--(Marketwire - July 8, 2008) - Vivaty Inc. today launched the public beta of Vivaty Scenes, a fun new way for people to personalize a virtual scene and then socialize with friends. Entirely browser-based and available publicly on both Facebook and AOL's AIM service, Vivaty Scenes is built on the company's end-to-end Immersive Web platform, which is designed to enable visually rich, engaging virtual experiences across a broad range of social networks, communities, brands, and online destinations. "Vivaty Scenes transforms a user's everyday social network or IM client visit into a more expressive, visually engaging, and fun experience," said Keith McCurdy, Vivaty co-founder and CEO. "There is an undeniable trend towards new levels of socialization and engagement on the web, and we have removed the technology barriers preventing users from having a more immersive web experience. This is the first of several products on the Vivaty platform and we're excited to make it available on a massive scale." Vivaty's immersive platform is built to power a broad range of distributed virtual experiences that can live inside any browser-based community, service or site. The company recently launched as one of the first featured mini-applications on AOL's popular instant messaging service, AIM. Both AIM and Facebook users can socialize and share photos, videos, and music, all inside their personal virtual scenes. In addition to personal scenes, Vivaty's platform will also power broader virtual experiences for major global brands. 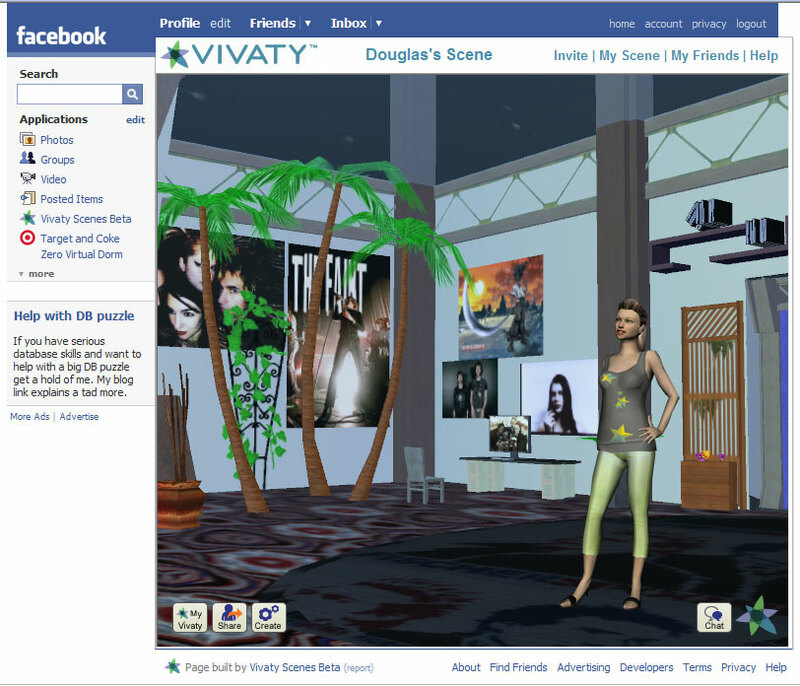 The first branded virtual experience on the Vivaty platform is also available to Facebook consumers today. --  Have a virtual party! Vivaty Scenes is a free service currently available on Facebook and AIM 6.8, and the platform currently supports Windows XP/Vista and IE 6 or 7. More information is available at www.vivaty.com. Vivaty's vision is to make the Immersive Web a reality by transforming the flat web into a more visually rich and expressive experience that amplifies socialization and engagement. The company's web platform is designed to enable distributed virtual experiences anywhere on the web. Founded in 2007, Vivaty is led by a team of web, gaming, and graphics experts, and is backed by venture capitalists Kleiner Perkins Caufield & Byers (KPCB), and Mohr Davidow Ventures (MDV). For more information, please visit www.vivaty.com.